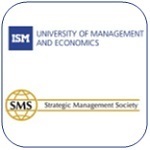 Strategic Management Society is an organisation unique in bringing together the worlds of reflective practice and thoughtful scholarship. The Society consists of nearly 3,000 members representing a kaleidoscope of backgrounds and perspectives from more than 80 different countries. Membership, composed of academics, business practitioners, and consultants, focuses on the development and dissemination of insights on the strategic management process, as well as on fostering contacts and interchange around the world. We are pleased to announce, that one of conference extensions will be organised in Vilnius, Lithuania. Therefore on behalf of the Strategic Management Society (SMS) and ISM University of Management and Economics in Vilnius, Lithuania, we invite you to attend the “Strategic Innovation and Entrepreneurship in Transitioning and Emerging Economies” Extension on October 11, 2012 at ISM University of Management and Economics. You may participate in this Extension without attending the main SMS conference. There is a US$ 85.00 registration fee (for current SMS members) which must be paid directly to SMS via the following link: http://prague.strategicmanagement.net/registration/extensions.php. The fee is $105 for non-SMS members. The registration fee includes a light lunch, coffee/snacks and gala dinner. The day-long Extension will focus on how dynamic, transitioning and emerging market economies are trying to carve out a niche in a global economy. Participants will have an opportunity to engage interactively with leading scholars and peers about important ‘Strategic Innovation and Entrepreneurship’ research and teaching issues. Programme details can be found at: http://prague.strategicmanagement.net/vilnius_extension.php. This event will feature an array of distinguished scholars from three different continents, faculty and practitioners from the Baltic region. and also experienced Baltic executives. This Extension would be of interest to academics as well as practitioners interested in learning more about strategic innovation and entrepreneurship from/in transitioning and emerging markets. The interactive nature of this event would particularly benefit PhD students, junior academics, as well as those recently introduced to the strategic innovation and entrepreneurship as well as the transitioning and emerging markets phenomenon. Please direct your questions to extension co-chairs Modestas Gelbuda (modestas.gelbuda@ism.lt) and Aldas Kriauciunas (akriauci@purdue.edu). How do the Management Skills of European Managers Compare?